I’ve been freezing Matt work lunches since last fall, I started with Tamales, freezing 2-3 of them in their husks wrapped in foil. I then made Burritos. He has a microwave at his work (doesn’t just about everybody?) It’s easy for him to reheat them. However, his favorite meals have been soups, stews or rice based meals in bowls. 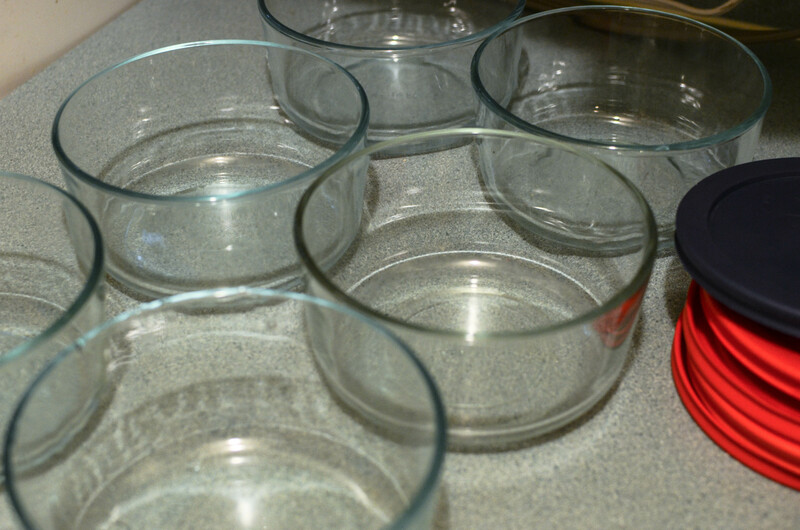 I froze a few in the plastic lidded tupperware items I had around, but I hated it. This leads me to my confession: I absolutely loathe plastic dining ware, of every sort. It gets easily stained, smelly and lost. I’m sure when we have kids we’ll have to do SOME plastic, I just don’t like it. I don’t like drinking out of plastic, I’m convinced that it taints the taste of the water. Wow, when did I become this deserving little prude, can I say developed world problems or what. Good grief. Geez, I should be thankful for bowls and cups, no matter what the type. Anyway, all this to say that I was hesitant to freeze lunches for Matt in plastic, just for him to reheat it again, it kind of grossed me out. 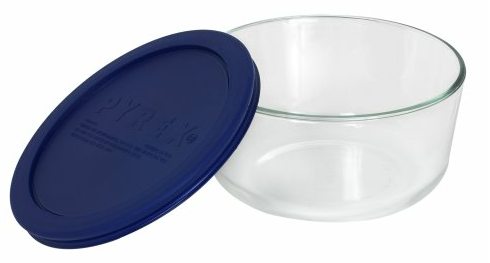 So after some sticker shock at the local walmart I finally gave in and invested in some glass pyrex 4 cup containers with lids (the lids are plastic, I know, but they are removed before microwaving). I’ve been slowly collecting them on sale, $7.99 is the going rate usually but I’ve purchased most of mine from $5-6, by watching for sales and looking for coupons. 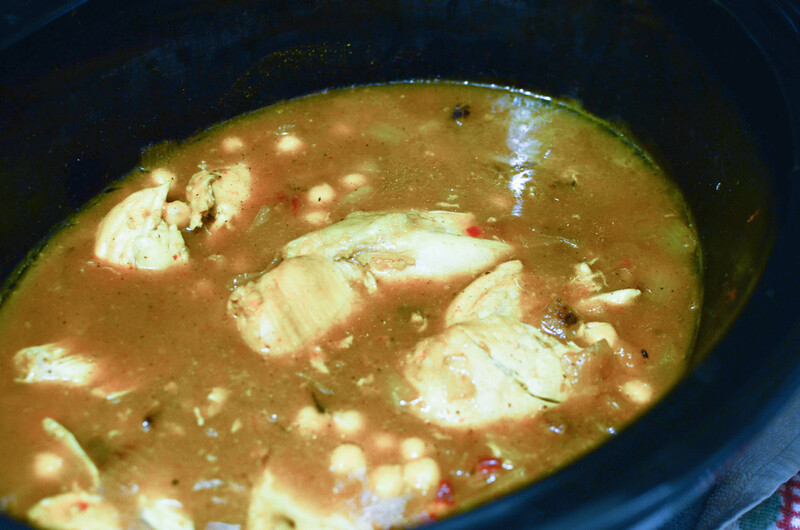 My latest one was a spin on a recipe I got from the Betty Crocker site, Chicken Curry. 4 chicken breasts made 6 good meals, I had some snap peas and cashews that I topped each meal with. Lay chicken breasts in slow cooker. In small bowl mix water, mango chutney, cornstarch, curry powder, salt, pepper and sriracha until blended, pour on top of chicken. layer onions on top. Cover and allow to cook on high for 3 hours, add drained rinsed garbanzo beans for last hour of cooking. Fork chicken apart gently. 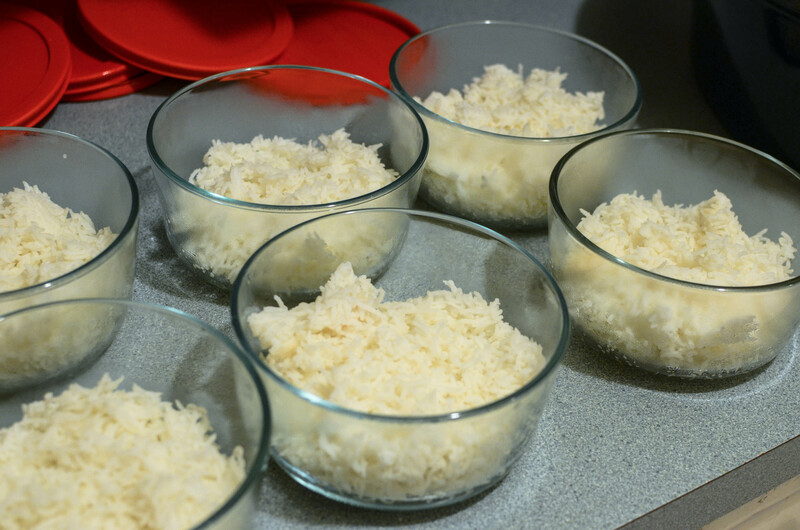 Do a quick taste test, add more spice or salt if desired. 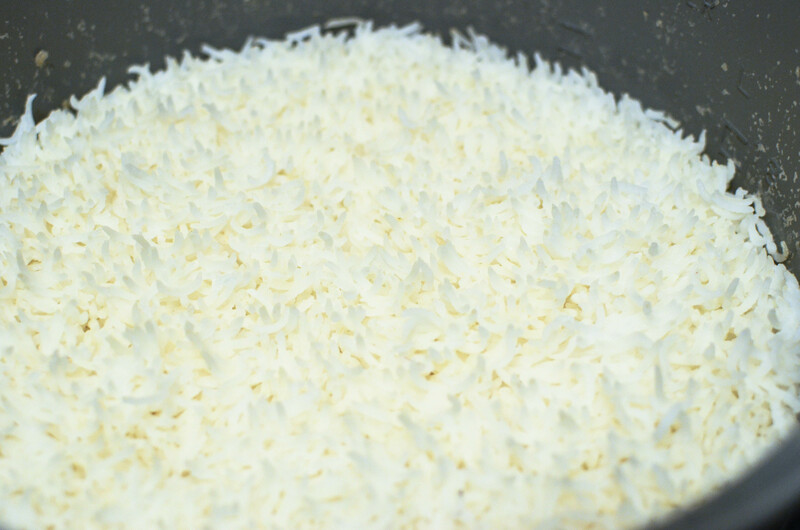 Cook 2 cups of white basmati rice in rice cooker or on stove according to manufactures directions. 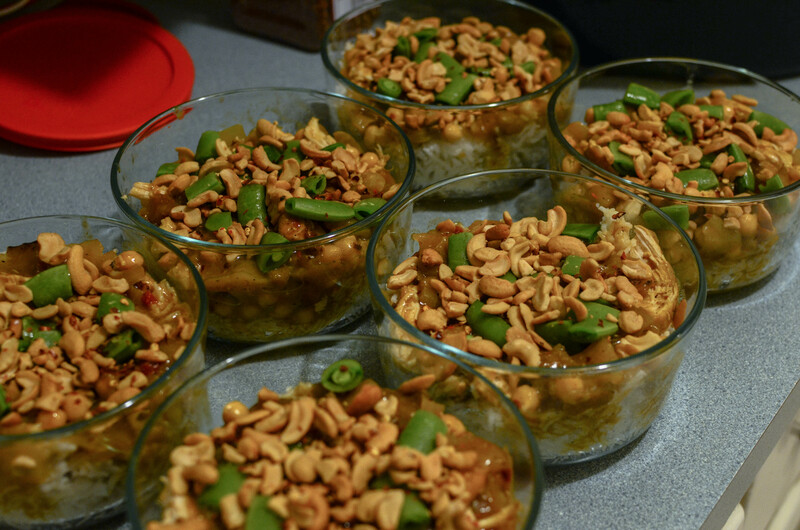 Divide rice into 6 bowls, top with chicken curry mixture, spoon chicken garbanzo mixture and sauce on top of rice. Top with cashews, dried red pepper flake (for more spice) and snap peas. Allow everything to cool a little before lidding up and freezing. 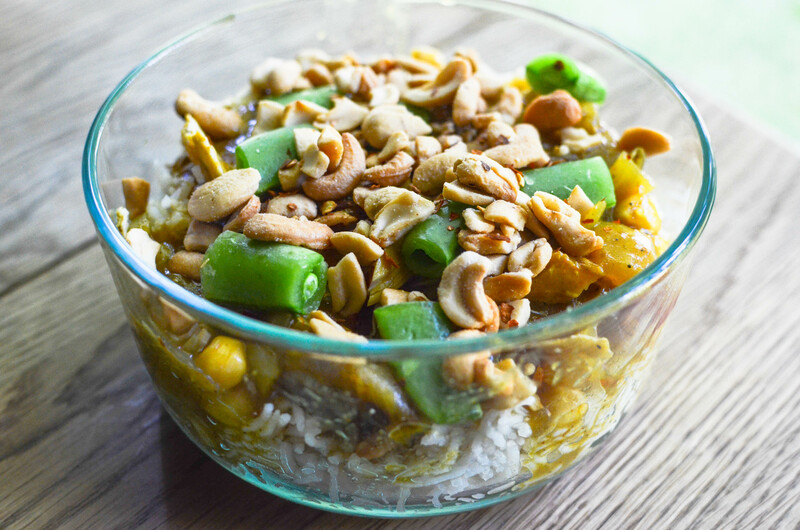 The cornstarch gave a great consistency to the curry that covered the rice well.